Inspiration comes in so many shapes and sizes and sometimes it’s not complicated or even seems special enough to warrant a story. This cocktail happened in the simplest of ways. Someone asked a question about Saturday morning cartoons. I recalled how much I hated them when my kids were young. I thought they were just loud and irritating and wished my kids could enjoy some of the Saturday fare I recalled from my childhood. The Lone Ranger, Sky King, Fury and My Friend Flicka among them (I just loved horses when I was little…still do!). A bit later that day I spied a cocktail on Liquor.com called ‘The Lone Ranger’ – can you blame me for feeling this was somehow prophetic, that I had to make this cocktail or risk forever being cursed by the ghosts of Lone himself and his sidekick Tonto? It didn’t hurt that it was so pretty but what did surprise me with this Tequila, Sparkling Rosé & Lemon Cocktail tequila was the mixing of tequila and rosé wine. To call those a unique combination would be the epitome of an understatement; I could not imagine them together which made me have to try it! I admit that the wine I bought won out over others because I loved the color; a really gorgeous pink. I wasn’t looking for an extraordinary rosé; I was simply looking for a rose to mix with tequila and this worked perfectly for my tastes. An effervescent blend of Argentina’s signature Malbec red grape and Merlot; it’s a light alcohol wine with flavors of strawberry and raspberry. All of a sudden I could start to imagine why this would be good; tequila is used in margaritas all the time with fruit components. Created by Jeffrey Morgenthaler, manager at the acclaimed Clyde Common in Portland, Ore, The Lone Ranger truly is simple and elegant; a combination of tequila, lemon juice, a bit of simple syrup and some brut rosé sparkling wine. I thought it looked pretty and sounded interesting but I was unprepared for just how much I would love it. 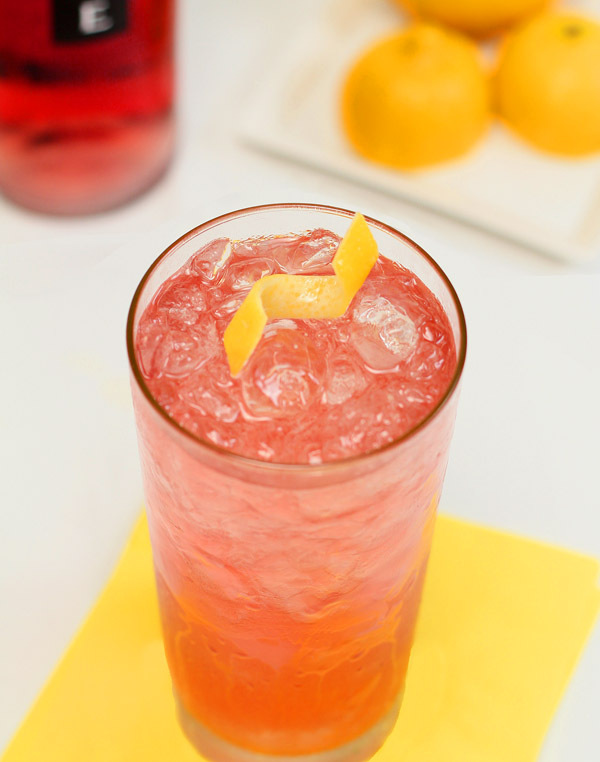 Cool, crisp and refreshingly light with that little kick of tequila; it’s jumped way up the leaderboard for favorite summer cocktail! This Lone Ranger needs no Tonto. Put the tequila, lemon juice and simple syrup in a shaker filled with ice and shake vigorously. Open the shaker, add the sparkling wine (do not shake) and strain into the ice filled glass. I've found what really speeds up the process is to heat half the water with the sugar and then once the sugar is dissolved I add the other half as ice water and pour the mixture into a container to chill. I have a really nice bottle of tequila but it’s not silver, will that ruin this? Not at all; I just don’t want people using very cheap tequila…because it would. Enjoy!! Can you make this in a bulk quantity in a pitcher? Thinking it would be nice for our July 4th party, but I don’t want to have to mix all individually! Thanks!! Looks wonderful! What I would do is measure all the ingredients except the sparkling wine and put them into a pitcher and then as you serve the drinks, top them with some of the wine and give each glass a stir. Since that wine has some effervescence to it; you don’t want to lose that by having it sit out with the other ingredients for too long or I fear it would go flat. Would that work? Yes – thanks so much. Can’t wait to try it! Would love to hear back if she tries it. I just can’t say how much I loved, loved, LOVED this cocktail! How do you came up with these recipes, each one of them is just perfect. Every time I stop by I am always pleasantly surprised. You have the best cocktail collection of recipes ever, that’s for sure. 🙂 Have a nice week. I have been on a rose kick since getting back from Provence so this cocktail is EXTREMELY well timed. You are definitely right about the color – it is gorgeous!!! Definitely think I will be serving a lot of these this summer!! Great last line! I’m having a couple friends over tonight for Happy Hour, and I’m having so much fun browsing your cocktail recipes. What to make. What to make. This drink sounds so good. I’m definitely trying as soon as possible. Being from Colorado, I’m wondering if you know The Lone Ranger is being filmed right now in Creede, Colorado? Johnnie Depp is playing Tonto. He is more of a shaman type character in this new movie. I have a cousin from the Dallas area that owns an old cabin there. She has a local resident refurbishing the cabin and was hoping they would finish it this summer. But, they received a letter that while the filming is going on, they have taken down electricty and will send them a check for staying outside the town while visiting the area. I grew up with all these tv shows as well. Too bad our kids today are missing out on those oldies that taught us so much about good vs. evil. Small world indeed…I did not realize that until yesterday but thought I should include a note about that in the post if I have a moment! Saw a photo of the two of them too and hear it’s going to focus more on Tonto. Thanks so much for the additional information; I’m going to mention it too! I thought it sounded interesting but I have to say…was not quite ready for just how much I loved it. I honestly think getting a less expensive ($11) bottle of wine was key; not a kids slurpy exactly but with enough fruitiness to really make that mix with tequila and lemon work. So cold and easy to sip I broke my own rules and actually drank the entire cocktail after an afternoon shoot. Oops! First off, I love Clyde Common. Their cocktails are truly special. Second, I’ve never had THIS one. And now I have to! Or, with your help, I can now make it on my own. Sounds wonderful. I just can’t tell you how good this is…pretty too. Love that you know the place! Ohhh.. I’d want some of that! I was lucky, by the time my children were watching Saturday morning cartoons they had some pretty good ones with veiled adult humor. My personal favorites were Courage the Cowardly Dog and Johnny Bravo. I’m not saying that I would rather watch these than anything else, but they made Saturday morning cartoon-a-thon much easier to bear. One or two of these cocktails would make even Rugrats easier to bear. I’ll take your word for it…they always seemed so frenetic and that just wasn’t my thing on Saturday morning; M-F mornings always seemed frenetic enough during the school year, I so wanted Saturday to be more peaceful!